AND CLOSE TO WHERE YOU ARE IN GERMANY. Customer proximity is not just a philosophy that our group lives by, but also a decisive locational advantage. As a steel service specialist, the special precision of our strip machining makes us a strong partner within the group, and for a wide range of industries in Germany and Europe. 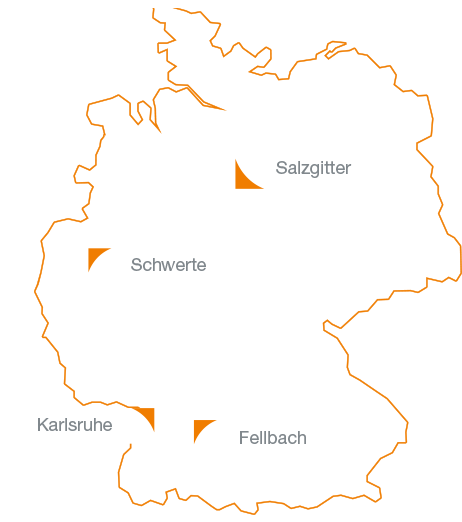 We are well positioned in relation to the steel processing centres and superbly organised throughout Germany with our headquarters in Salzgitter incorporating Salzgitter Flachstahl and our two steel service centres in Schwerte and Karlsruhe. Of course, we also have a presence in all major neighbouring countries. This geographical proximity guarantees local responsiveness and facilitates logistical cooperation – important success factors that provide real benefits for our customers in the face of increasingly fierce competition. Here you can find our sites and the corresponding address and contact details.